When looking for business loans you will most likely be presented with several options. One possibility that you might see is a loan that does not require collateral. These are also referred to as an unsecured loans by some people. With an unsecured loan, you get the money that you need but are not required to put up any collateral for the loan. These types of loans come with potential benefits and drawbacks. Here are a few pros and cons of business loans without collateral. Will not tie up collateral- When you get a traditional loan, you are required to put up some kind of collateral in return for the loan. This means that you may have to include your place of business as collateral for the loan. This can leave you with a feeling of uncertainty throughout the life of the loan. If you default on the loan, the bank can take your business or whatever you put up as collateral. With an unsecured loan, you can still remain in business or keep the property if you default on the loan. Flexible programs- Many unsecured business loans are very flexible in nature. You can find an array of loan choices and many of them may fit your needs. A number of different banks offer these types of loans. Does not require property- Sometimes, you do not have a lot of property with your business. You may just need some working capital for your new business, but you don't really need to buy anything like a piece of property. This can provide you with the money that you need without requiring that you buy a piece of property or asset to secure it with. Higher interest- This type of loan represents a much bigger risk for the lender. If you default on the loan, they may have a difficult time ever seeing that money again. They cannot foreclose on any particular asset, so they have to take you to court and get a judgment against you. If you are out of business, they might not be able to get any money out of you. As a result of this risk, they require a higher return on their investment in the form of higher interest. Higher payment- As a result of the higher rate of interest, you will have to come up with more money for your monthly payment than if you went with a secured loan. If you are a new business, a large payment is usually not very enticing. Therefore, an unsecured loan may not be in your best interests as a result. It is hard to budget for a large payment when you may not have much revenue coming in. 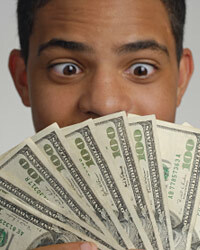 Harder to get approved- An unsecured loan usually requires a good credit history. If you have questionable credit, you will not be able to get this type of loan.